Hi everyone! 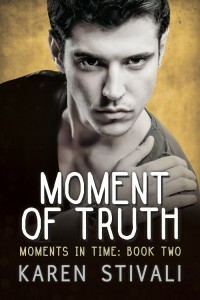 I’m Karen Stivali and I’ll be here for the next few hours to talk about my brand new release MOMENT OF TRUTH! 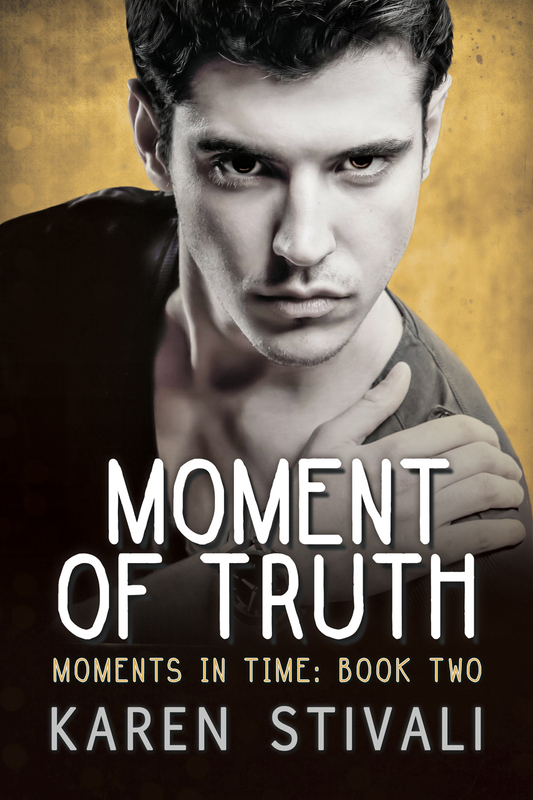 MOMENT OF TRUTH takes place a few months later, when Collin and Tanner decide to spend the summer together in the much more liberal and accepting environment of Fire Island. Collin expected to spend another summer fixing cars and working at the college pizzeria. Instead, he’s living in a beach house on Fire Island, waiting tables at a hip seaside restaurant and, for the first time since he and Tanner got together, they can publicly be known as boyfriends. Being “out” takes some getting used to, but with the help of new and old friends, Collin is happier than he ever imagined. And more in love. But newfound freedom brings unexpected challenges, and when friends get flirty, old insecurities arise. Moments of doubt and jealousy threaten their happiness, and Collin and Tanner must confront the truth or risk losing it all. This is definitely a series that’s best read in order because each book is a complete story that takes place at very different times in their relationship. There are no cliffhanger endings (I can’t stand them as a reader, so I’d never write one—I promise! ), just an opportunity to watch their relationship evolve as these two young men are confronted by a variety of life’s trials. I don’t usually title my books until I’m well into writing the story. At some point while I’m writing I’ll think of something that just “fits” and that’s never been more the case than in the series. 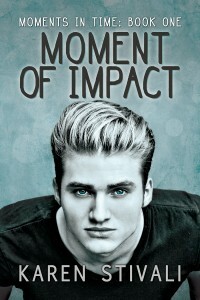 While writing the first book it occured to me how many specific moments there were in the story where Collin, the point-of-view character, had his life completely change. You know the kind of moments I mean. The ones where you look back on a memory and you realize that there was a specific second where something happened that altered everything that happened after it. Collin has several moments like that in book one, several experiences where the IMPACT of that one MOMENT changes everything. Hence the title MOMENT OF IMPACT. When I decided to write more of Collin and Tanner’s story, I focused on what the defining moments would be in each phase of their relationship and that’s how the other titles were born. I loved finding the different pieces of their lives that would be so life-altering and would change them as individuals and as a couple. There are several MOMENTS OF TRUTH in book two as this couple grows and matures. So now it’s time for my question to you. What were some of the most defining moments in time in your life? The realization you were in love with someone? The decision of where to go to college? A mean thing you said and couldn’t take back? A good choice? A bad one? A freak accident? Tell me one of your most memorable moments in the comments below and I’ll choose a random winner (at the end of the day) to win an e-copy of MOMENT OF IMPACT (and if you already have that, then it’ll be your choice of my other titles). I’m so sad. The end of our time is here already. We’ve talked fanfic and survivorship and father/son relationships. But it’s time for me to draw this event to a close, because it’s going to snow (again) and I’m going to have to shovel in the morning. The winner of the copy of A Wounded Promise is: H.B. If the winners can email me at ashavandoyon@gmail.com and let me know what email they use for their account at the Dreamspinner Press store, I’ll get those books added to your shelf. Thanks again for spending the evening chatting with me! Hope you aren’t sick of me yet! 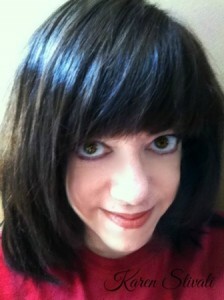 This is Ashavan Doyon coming to you from the Dreamspinner Press Blog. I know, that last post is a bit of a downer. An important one for the story, but still hard to talk about. I wanted to touch on one last theme before I pick the winners and let you all off to read the story yourselves! 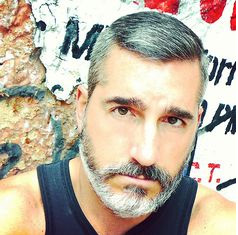 One of my favorite characters in the Sam’s Café Romance stories is Justin’s dad, Sam. We see a lot of Sam in The King’s Mate, but in A Wounded Promise we get only glimpses. But the glimpses we get are critical ones. One of the things I wanted with the character of Sam was a parent who had struggled with his son coming out, but one who came quickly to acceptance. I’ve tried to reach that in a few stories, but I think it’s the Sam’s Café Romances where I succeed the most. This is a parent in whom Justin confides. While we don’t know really what kind of relationship Justin had with his mom, it’s clear his relationship with his dad is one of trust. In an early scene, Sam and Justin are talking about Justin being frightened. It’s an important scene, because you really get that Sam loves and trusts his son. Sam slid off the ledge and held out a hand. 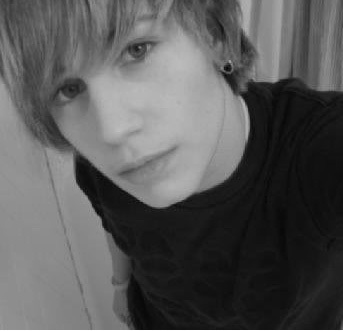 “Justin.” Sam was looking at him with a sad sort of smile. There’s a closeness between the two of them I think I envy a little bit. It’s a relationship I saw sometimes with my brother and my dad, but I never had. Maybe it’s because I didn’t have it that when I write an accepting parent it tends to be the father? So, this is the last chance to win a copy of the ebook for A Wounded Promise. Tell me about your favorite father figure in a male/male romance. I’ll also be here watching the comments, so feel free to just chat too. This is Ashavan Doyon, back again to talk about A Wounded Promise. So I wanted to talk a little about trauma, and Justin’s particular feelings. Specifically, the difficulties he has as a survivor of sexual assault. “Since Peter.” Justin closed his eyes. It was hard to see, but Sam noticed. After Peter, Sam had learned to notice a lot of things. 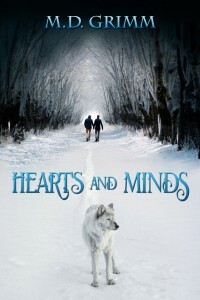 “It wasn’t that.” Justin looked up, and Sam’s heart splintered again. The steel-blue eyes that were the mirror of Sam’s own seemed to almost drown in the red that surrounded them. “You cried all night?” Sam asked softly. Justin’s answer was a shy nod and a look away. Sam nodded. “I guessed. He hit you?” Sam braced himself for a yes. An ongoing theme in the story is Justin’s struggle not to see himself as broken. I didn’t want the idea of Justin being a survivor to just disappear. He absolutely remains affected by his experience, and it’s the unexpected interaction between those triggers and Russ’s drunken anger that leads to Russ waking up alone at the start of the story. It’s important to me that a character being sexually assaulted isn’t some minor plot point. When I included that detail in The King’s Mate, I knew I had to bring it back to the forefront in the sequel. I hope I’ve done that some justice. What are your favorite stories that deal with some element of survivorship? Comments for my remaining posts tonight count as entries to win a copy of A Wounded Promise in ebook format. And I’m back… sorry about that, travel time between the day job and home got in the way. For those just joining the party (we’re serving mocktails, people, as no one here seems to be the drinking sort! ), this is Ashavan Doyon talking about my new release, A Wounded Promise. I wanted to spend a few minutes talking about the cover. For The King’s Mate, because it’s a novella in an anthology, I didn’t have any say over the cover. It wasn’t quite long enough to get it’s own, so it has the standard anthology cover of a hot shirtless guy at a baseball field with my title and name below it. That was good (there was no need for trying to maintain consistency) and bad (consistency helps hold a series together). So for A Wounded Promise I was entering with a clean slate. It was exciting to finally try to put a little more imagery to the story. For covers you fill out a cover request with some details… title, author, subtitle. Preferred styles. What covers did you particularly like. That gets you paired with an artist, who is given a brief synopsis, some physical descriptions of the characters. I try to include pictures, if I can, to give an idea of what I’m looking for. I think the artist did a great job coming up with images that fit those molds, and I’m especially happy with the model for Russ, because there is an age difference in the characters, and having a younger graying model here is important, because Russ isn’t so much older that the relationship should squick people, but the gray can make it seem so. What really impressed me though was that the artist really took those vague images and managed to convey the angsty conflict that is in the novella. I’m really happy with it. This is the last post to comment for a chance at a copy of The King’s Mate, so I hope you’re still up for some discussion! Do cover images influence how you imagine the characters? Do you prefer the sort of faceless bodies on covers, or do you like to see the whole character? Let me know! Hello! Ashavan Doyon here, still talking about my newest release, A Wounded Promise. I’ve mentioned that A Wounded Promise is a sequel, and I wanted to talk a little bit about the original story, and how I got to the new one. 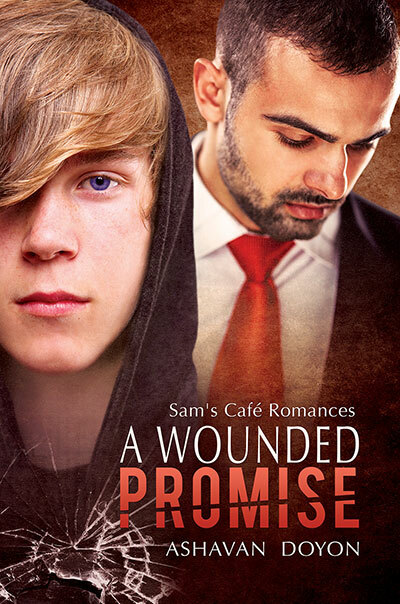 A Wounded Promise is book two of the Sam’s Café Romances. When I started emailing with Dreamspinner about the sequel, one of the things I had to do is name the series. They give that a fancy name, but really, it means boiling down the essence of the story. The process drove me nuts. Ok, so I was already there… let’s just pretend for a moment that I’m not a crazy man obsessed with my characters, shall we? This is the sequel to a story titled The King’s Mate — based around a chess competition in a college town café. I’d already gone through agony deciding whether or not to carry through the chess theme in the title, and now I had to name the series? Ultimately I decided the central thing that brought the two lovers together wasn’t a chess match, but rather the café itself, and the significance of the café to both of them. I confess there’s a mercenary bent to this too. If readers are enjoying the café, this gives me room to please both those who want more of our lovers from the story, and those who might want other characters explored. Naming the series for the café gives me a little more freedom. Also, there were some folks who felt chess wasn’t as central to the story in The King’s Mate as they might have preferred, so I wanted to honor that and not have people feeling hoodwinked. In writing A Wounded Promise, I’ve tried to keep up to that standard, and I hope Russ still makes readers ache, in that beautiful yearning way that keeps us turning pages. I get criticized sometimes for my characters being angsty. I don’t apologize for that. I like angsty. I think the angst and struggle and desperate wanting is where the best parts of romance is. It’s that stuff, the heartache and despair and surety of pain that make the reward worth it in the end. When I see characters go through hell, whether emotional or physical or traumatic, and see them somehow still come together, it gives me hope. This is a progression from The King’s Mate — where we see a sweet exploration and a bit of mystery and a hint of pain lingering in the background – to A Wounded Promise where we see that hint suddenly so brutally clear that there is no longer a choice. They have to face it. Because the promises they’ve made to love each other are wounded. And we’ll talk more about that later. In the meantime, a question, because I still want those comments (and someone still has to win that copy of The King’s Mate!) I based both stories around a café – loosely based around a couple of similar places in the town where I grew up. Is there a similar sort of place where you go to get a coffee? Do homework? Write? What does café mean to you? Hello! This is Ashavan Doyon and I’m here to take over the blog for a chunk of today and talk about my new release: A Wounded Promise. Somewhere someone is opening A Wounded Promise, and stumbling into Russell Pine waking with a hangover. The room begins to spin (or maybe it never stopped) and Russell tries in the haze of his hangover to make sense of vague recollections from the night before. Drinking vodka right from the bottle. Anger welling up. He’s woken up alone, his lover gone, and he can’t even remember what happened. I like Russell, and I’ll admit putting him in that place was hard for me. I’ve never had a drunken night, or a hangover in the morning (I’m not and have never been a drinker). I relied a lot on waking up with a migraine to frame the descriptions of how he feels and what that’s like, and I hope it comes across well. As a character, I love Russ. I write a lot of early college age romances, and while his lover fits that bill well, Russ is older, in his mid-late thirties. He’s a returning character, as this is book two of the Sam’s Café Romances. While I try to make it possible to read the book as a standalone, it goes without saying that it will help enormously to have read The King’s Mate first. So, next post I’ll do the standard cover and blurb thing, but I’d like to start with a question: What was your most memorable drunken night (or morning after)? Yes, there will be some giveaways for commenters. Also don’t forget to BUY THE BOOK… you know you want to! Here’s the link to my The Shifters part 1 book trailer – check it out! I had a lot of fun making it and it is office appropriate. Let me know what you think! Good, bad, meh? Be honest! I plan to do another trailer when all of Part 2 is published. I often listen to music when I write and it’s often instrumental – but not just any instrumental. I love EPIC music! 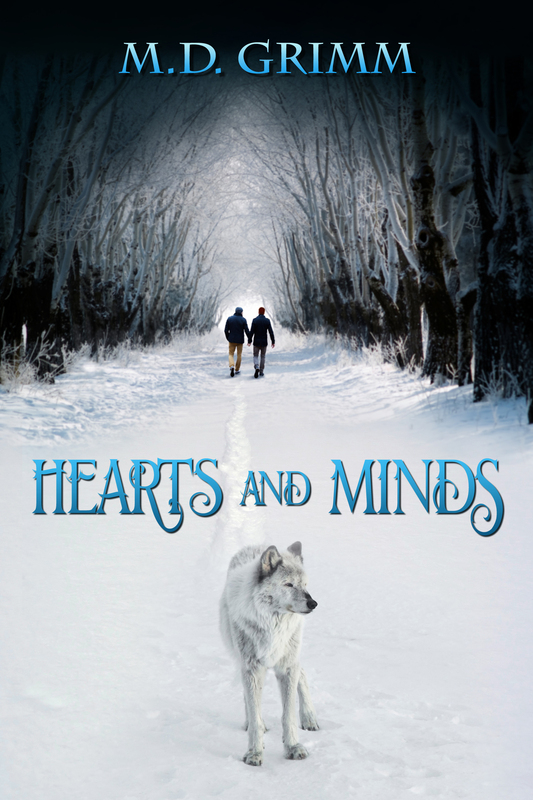 I listened to the following groups a lot when I wrote “Hearts and Minds” and they are very inspiring, and I don’t have to focus on them, like I do if there are lyrics. They fade into the background but not all the way. A couple of my favorites are: Two Steps from Hell, E.S. Posthumus, and Mary McLaughlin (piano, Irish). My question to you is – What music do you listen to: to write, read, clean the bathroom, whatever? Fav artists, music groups, musicians…? I want to know! Since the books are all dependent upon each other and grow more so as the series progresses, I’d suggest reading from book #1 if you haven’t already. To wet your anticipation for the future: “The Serpent and the Angel” (book 8) will be released on March 27th (I have another DSP blog scheduled that day), “Ghosts of Halloween Past” (sequel to “Blind Devotion”) will be released in October, and I’m working on book 9 “Predator and Prey” (who likes sharks?). Then I will swing out of the “past” and be firmly in the present for later books. “Ghost of Halloween Past” will focus around Halloween and I think you’ll be surprised by the secret Travis has been keeping from Jack about what happened to them years before the events in “Blind Devotion” (book 3). And for those curious, the strong Agent Poe will return. He’s scheduled for book #12, I believe. That’s where I put all the info you could ever want to know about The Shifters series. What is your idea of a romantic night with your significant other?